Empress Jitō (持統天皇, Jitō-tennō, 645 – December 22, 702) was the 41st Emperor of Japan, according to the traditional order of succession. Jitō's reign started in 686 and ended in 697. Historians consider details about the life of Empress Jitō to be possibly legendary, but probable. The name Jitō-tennō was created for him posthumously by later generations. The conventionally accepted names and sequence of the early emperors were not to be confirmed as "traditional" until the reign of Emperor Kammu, who was the 50th monarch of the Yamato dynasty. In the history of Japan, Jitō was the third of eight women to be empress. The two female monarchs before Jitō were (a) Suiko and (b) Kōgyoku/Saimei. The five women monarchs after Jitō were (c) Gemmei, (d) Genshō, (e) Kōken/Shōtoku, (f) Meishō, and (g) Go-Sakuramachi. Before she became the monarch, this princess's personal name (imina) was Unonosarara or Unonosasara (鸕野讚良), or alternately Uno. Princess Uno was the daughter of Emperor Tenji and she was the wife of Emperor Temmu, who was Tenji's brother. In this period, the court and the government was centered at Fujiwara Palace in Yamato. 686 Shuchō 1 (朱鳥一年): In the 15th year of Emperor Temmu's reign, he died. The succession (senso) was in effect received by his wife. Princess Uno wanted to ensure that her son, Prince Kusakabe, would become the next monarch. 690 Jitō 4 (持統四年): In the 4th year of the period in which Princess Uno functioned as monarch, Prince Kusabake died. 691 Jitō 5 (持統五年): Princess Uno was formally established as the monarch (sokui); and she became known as Empress Jitō. This was confirmed in ceremonies. 691 Jitō 5 (持統五年): Jito's grandson, was then named as Jitō's successor; and he would become known as Emperor Mommu. 697 Jitō 11 (持統十一年): In the 11th year of Empress Jitō's reign, she abdicated. In retirement, she took the post-reign title Daijō-tennō. After this, other emperors who abdicated were known by the same title. 702 (Taihō 2): Daijō-tennō Jitō died. 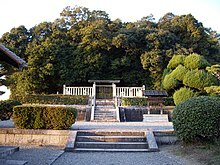 The actual site of Jitō's grave is known. This empress is traditionally venerated at a memorial Shinto shrine (misasagi) at Nara. The Imperial Household Agency designates this location as Jitō's mausoleum. It is formally named Ochi-no-Okanoe no misasagi. ↑ Ponsonby-Fane, Richard. (1959). The Imperial House of Japan, p. 54. ↑ Titsingh, Isaac. (1834). Annales des empereurs du Japon, p. 59; Brown, Delmer. (1979). Gukanshō, pp. 269-270. ↑ Kelly, Charles F. "Kofun Culture," Japanese Archaeology. April 27, 2009; retrieved 2011-10-18. ↑ 7.0 7.1 7.2 7.3 Varley, H. Paul. Jinnō Shōtōki, p. 137. ↑ Titsingh, pp. 59–60; Brown, p. 270. ↑ Titsingh, p. 60; Brown, p. 270. ↑ 10.0 10.1 Titsingh, pp. 60. ↑ Varley, p. 44; a distinct act of senso is unrecognized prior to Emperor Tenji; and all sovereigns except Jitō, Yōzei, Go-Toba, and Fushimi have senso and sokui in the same year until the reign of Emperor Go-Murakami. Compare Imperial Household Agency (Kunaichō), Ceremony of Accession (Sokui-no-Rei). Retrieved 2011-12-23. ↑ Nippon Gakujutsu Shinkōkai, (1940). Man'yōshū. p. 18; this waka is numbered 42. ↑ Nippon Gakujutsu Shinkōkai, p. 18 n1; this would be the so-called "Thunder Hill" in the village of Asuka near Nara. This page was last changed on 13 August 2018, at 02:56.